We all know Americans love their sugar. But data from market research firm Euromonitor suggest that the love may border on lunacy, at least compared with the rest of the world. Here in the United States, the average person consumes more than 126 grams of sugar per day, which is slightly more than three 12-ounce cans of Coca-Cola. That's more than twice the average sugar intake of all 54 countries observed by Euromonitor. It's also more than twice what the World Health Organization recommends for daily intake, which is roughly 50 grams of sugar for someone of normal weight. In Germany, the second-most sugar-loving nation in the world, people eat roughly 103 grams on average. In the Netherlands, the country with the third-biggest sweet tooth, people eat 102.5 grams. And in Ireland, which ranks fourth on the list, sugar intake falls just short of 97 grams. At the other end of the spectrum are India, Israel, Indonesia and China, where people apparently don't like sweets. In India, people eat only about 5 grams per day on average. In Israel, it's 14.5 grams. In Indonesia, it's just over 15 grams. And in China, it's just under 16 grams. The good news for Americans is that they fare a bit better when it comes to fat consumption. Belgium, where people eat 95 grams of fat each day on average, holds the distinction of being the world's most fat-crazed country. Germany, where people eat 86.5 grams of fat each day on average, is second. Finland, where people eat just shy of 81 grams, is third. And the Netherlands, where people eat just over 80 grams, is fourth. The United States is 16th on the list, at 65.5 grams, roughly 12 grams more than the average seen across the 54 countries. India, Indonesia and South Korea, where people eat the least amount of fat, consume 10 grams, 15.5 grams, and just over 20 grams per capita, respectively. 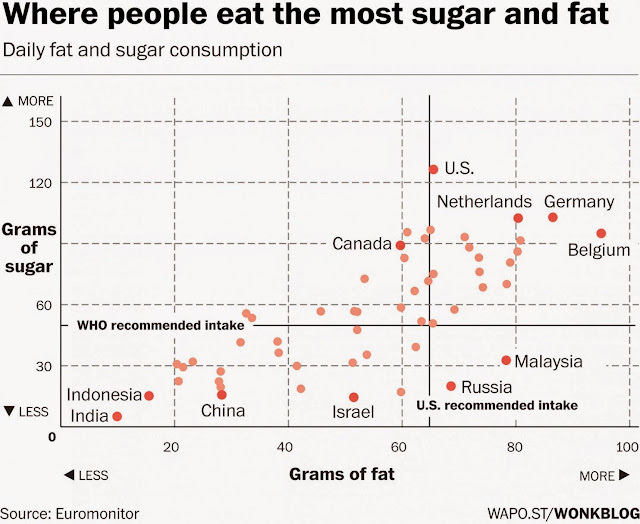 Interestingly, neither sugar nor fat consumption seems to be a good indicator of obesity — not at least among those countries that eat the most fat and sugar. Sure, Americans are both eating way too much sugar and outpacing the rest of the world in waistline. But outside of that, there doesn't seem to be much of a suggestion that an affinity for either is associated with higher rates of obesity in these countries — based on this data at least. Germany, which ranks second in both sugar and fat consumption per capita, is among the skinniest nations in the developed world. Only 14.7 percent of its population over the age of 14 is considered obese, according to data from the Organization for Economic Co-operation and Development (OECD). Similarly, other countries, including Belgium, the Netherlands, Finland and Sweden, are both near the top in sugar and fat intake, and near the bottom in obesity rates. Lower sugar and fat consumption, however, does appear to align — at least a little more — with lower obesity rates, probably because it reflects lower consumption of food more generally. India, Indonesia and China, which are at or near the bottom of the list in both sugar and fat consumption, also happen to have the three lowest obesity rates (2.1, 2.4 and 2.9 percent, respectively) among the countries the OECD tracks. What exactly does this all mean? It's unclear. But it does make you wonder whether there's a better gauge for why people in some countries are so overweight and others are not. One possibility is that it's not the raw amount of fat or sugar content alone that matters, it's also the type of food that's being eaten. In the United States, processed foods are still wildly popular, a fact that could offer one more theory of how this country came to have an obesity rate above 35 percent.